This family of eagles was having a typical eagle day, with daddy eagle watching protectively over his little eaglets, when a 5.3 magnitude earthquake struck near their island. The nest shakes and A-40 flies off the nest in momentary terror, before quickly returning to the nest to protect his children. A magnitude 5.3 earthquake struck near the Channel Islands off the Southern California coast early Thursday afternoon, jolting residents — including a male bald eagle watching over his young. 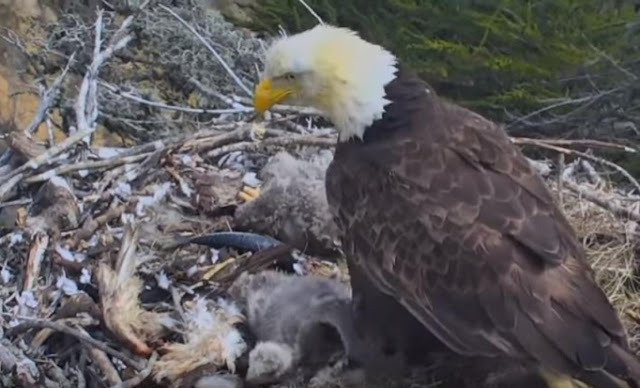 A Channel Island National Park live nest cam captured the moment the bird felt the quake, startling him enough to briefly fly out of view before returning to check on his eaglets. A couple of bricks fell off a chimney structure on a Nature Conservancy property on Santa Cruz Island, one of the eight Channel Islands, but beyond that there were no injuries on any of the islands, said Yvonne Menard, a park spokeswoman. No evacuations were ordered. The temblor hit beneath the Pacific Ocean about 12:29 p.m. at a depth of about 10 miles beneath the surface, the USGS reported. It was centered about 41 miles southwest of Ventura and 85 miles west of Los Angeles. It was produced by offshore faults that “are part of the system that moves Southern California around a bend of the San Andreas fault,” seismologist Lucy Jones tweeted. Jones, formerly of the USGS, described it as an earthquake of “moderate” size. Responses to "Majestic dad eagle loses cool in front of his family as earthquake hits"